Welcome back to the World of Dangan Ronpa. Monochrome mascots, pink blood, 16 students locked in a closed area and murder around every corner. In this new game we follow protagonist Kaede Akamatsu, the Ultimate Pianist as she wakes up in a strange enclosed cage containing a school, dorms, and various ‘Ultimate’ labs. They are being kept here by not just Monokuma, but also the monokubs. Monotaro, Monosuke, Monodam, Monokid and Monophanie. Who are apparently Monokuma’s children? Can robotic bears even have children? Who cares!? In the prologue you go around and meet with the other Ultimate Students. This killing games roster of talents include. Ultimate Robot, Ultimate Supreme Leader, Ultimate Cosplayer, Ultimate Artist, Ultimate Entomologist, Ultimate “Mage” [Magiancian],Ultimate Astronaut, Ultimate Maid, Ultimate Anthropologist,Ultimate Child Caregiver, Ultimate Inventor, Ultimate Tennis Pro, Ultimate Detective and of course the Ultimate ???. In the first chapter, Akamatsu teams up with the Ultimate Detective, Shuichi Saihara to try to find the ‘mastermind’ behind everything and investigate the mystery of why they are being kept locked up. Meanwhile, Monokuma introduces two motives to the group. The first motive, the “First blood perk.” meaning you could kill, own up for it, graduate, with no class trial involved. So basically, a get out of jail free card for the killer. If only things went that well. I made the grave mistake of underestimating Kodaka. I will never be making this mistake again in any future games he is involved in. Also, another thing to be said, if you are here and are not going to make it past the picture of Monotaro because you want to avoid spoilers. I should note, that even by Dangan Ronpa standards the executions in this game are a little more brutal the the ones in the previous games. So if you liked the previous installments but struggled with watching the executions. That is something to note for V3. With that being said as in my previous reviews of this game series, here’s a picture to distract you and let you leave if you want too before I start picking away at the spoilers. This time, check out this cool picture of Monotaro. Isn’t he a good boy? Still with me? Good. So as the time limit approaches we see a group of the students head to the basement and then, the sensor goes off showing that the camera’s in the library have activated. Akamatsu and Saihara make their way to the basement and we find Rantaro Amami, the Ultimate ??? dead. This is unprecedented for a lot of reasons. First, this is the first game to kill the student with the unknown talent but also because Amami was featured heavily in the promotional materials and had a character design very reminiscent of Komaeda’s design from Super Dangan Ronpa 2. He was set up entirely as a red herring character and was made for the entire audience to think he was more important then he was. This was not the only deception from the promotional materials either though. so at the end of chapter 1. We are left with the realization that all of the promotional material has duped us completely and that Akamatsu is not the protagonist but instead it’s Shuichi Saihara, the Ultimate Detective, which is both a good and a bad thing if you ask me. It’s interesting to have a detective as the main character as opposed to a support character like in Dangan Ronpa 1. However, it takes away the satisfaction of having a female protagonist in a main series game, something that a lot of the fandom was really excited for. It was neat to have the character you were playing as up until this point be the killer though. With only a few omitted details of actions, you realize that you set up the entire murder for the most part…of course. If we are being blatant about spoilers by now, you know that Akamatsu did not kill anyone in fact and the mastermind was truly Amami’s killer but it doesn’t take away from the fact that she did set up a way to murder someone and had the intent. I could sit here and reflect on my thoughts on every trial, but this review will probably be long enough as it is without that. So the story progresses from here in a very standard Dangan Ronpa manner. sometimes even more exaggerated then before, such as having a secret killer among the group. This time, there is two. Having the true talent of the Ultimate Child Caregiver be the Ultimate Assassin. Having the Anthropologist be a serial killer of women. This is where the writing becomes questionable and the fandom splits down the middle on how they feel about it. v3, the v being the roman numeral 50 is the 53rd season of a popular reality show produced by Team Dangan Ronpa. It claims that all 3 games have been a part of this franchise and none of it from the Hope’s Peak saga to now was real. You can take that at face value of course. The ‘never real’, ‘all a dream’, ‘all a tv show’ trope however is often viewed as poor writing. I can certainly see where Kodaka was going with it, he was making a commentary on not just his own series. The horror of writing a series about people killing one another and having thousands of people enjoying it. There is also some commentary to be said on what is expected from game sequels. Oddly enough, I saw a post about the New Smash Brothers that reminded me of a lot of the points that v3 was trying to make. How fans want things to be the same, but different, but they don’t want anything changed and they want it the way it was in x game in the franchise. That’s why v3 consisted of so many throwbacks and things that the fandom has come to expect. However, true to the games ideas and nature of the idea of ‘Truth vs Lies’ in the after credits there is some doubt thrown in the idea that all of the series had been fictional. While v3 might have, the Hope’s Peak saga may of existed and it is ultimately left to the player to decide what they want to believe. What is the truth and what is the lie. This may not of been the intention that Kodaka was going for. Honestly, in the end, v3 left a lot of fans of the series polarized about how they felt. Which can be both a good and bad thing, was it the best ending for the franchise? No. Was it worth playing and exploring the ideas and getting to enjoy the colorful cast that Kodaka laid out for us this time? Absolutely. The writing was not perfect. It was ambitious, the game is collectively larger then the first two games combined and it was in production simultaneously with DR3 Future and Despair arcs. So the attention of the writers was drawn thin and both productions suffered. What did not suffer though, was gameplay. For the most part, the trials functioned like the ones in the previous games however with slight improvements and new additions here and there. They certainly improved the Hangman’s gambit [Thank god], the logic dive was slightly easier this time around and other gameplay elements have been tweaked. However, by far the most popular addition to the trials was the scrum debates in which the cast is split down the middle and they have to argue their points against one another. Outside of the main game there is plenty of side material as well. Of course, the standard school life mode [Salmon Mode], in which you can finish off the Free Time Events that you were unable to obtain in the main story and date the other members of the school. There is also the board game mode, called the Talent Development plan which is pretty much the cross game non-despair AU the fandom has wanted for ages. You collect character cards through a gacha machine by getting coins in the other side bonus mode. A rpg style dungeon with Monokuma shaped Monsters. Last but not least of the side material for the game is the casino. In which you can play various mini-games to get tokens where you can either buy gifts for your classmate or unlock the Ultimate prize. A key to the Love Hotel. The love hotel event will trigger when you have a key and pick a character and you will visit them in a dream. In which you can see their ideal fantasy. It’s um, something, and considering how many coins it is to get a Love Hotel key it’s very unlikely you’re going to go through and get all of these unless you are collecting clips for youtube or are just extremely obsessive about completion. In conclusion, while the writing is spotty in places and the plot is a mess the game is still very fun and I honestly think it is more then worth the time it takes to play it. The characters are fun and the gameplay makes for a good experience. As for the ending, what is the truth? What is the lie? Was the entire series a reality show or was the tragedy real and it just faded into obscurity over time? I personally like to think it was the second one…but that’s just a theory…a…wait, best not get myself sued for copyright. I loved the ending and to be honest, If the game is a reality show I have no problem at all. The ending is ambiguous but my conclusion was… yes… was a game… then a reality show. 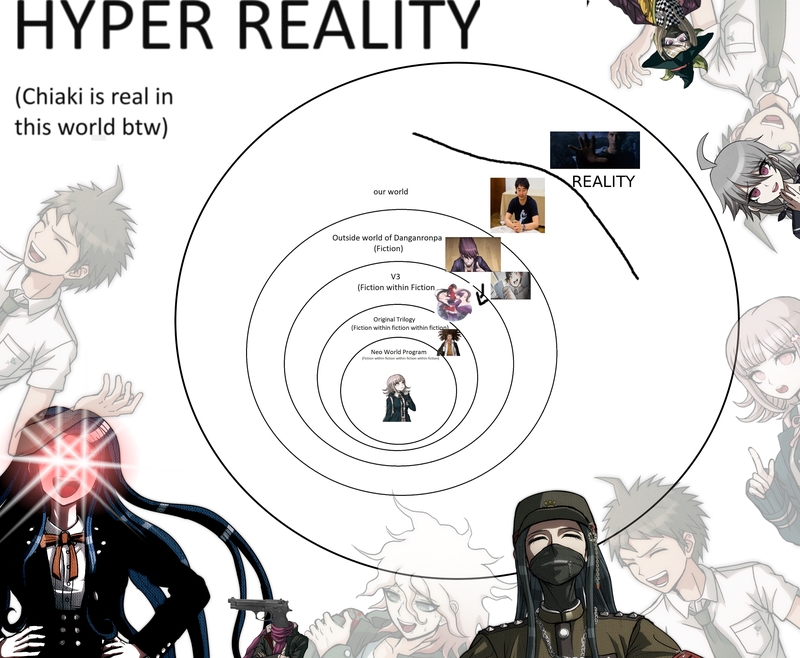 If Danganronpa 1,2,anime,etc is fiction in the V3 World, the V3 World is fiction in our world. My point is that the story of Danganronpa V3 doesn’t affect the original story because they occur within its own fiction line, “a show inside a show”, and in that show, those events really happened, despite that out there was just a game. About Kodaka, if another danganronpa comes out, it will not be from him unfortunately. I loved it too, the point is though that you can take it in many ways and in line with the games truth vs lies nature you can decide what is fact and what is not and yeah I know, I read Kodaka’s interview. I said any work by him in the future including the new game he is working on. I enjoy the game, but I didn’t like a lot of the character .